The Drexel University men’s and women’s crew teams started off strong with four wins in the nation’s capital at the George Washington Invitational, which was held on the Potomac River April 6 and 7. The men and women’s varsity and second varsity eights and the women’s four all came away with first place wins. On the first day of competition, the men’s varsity eight team, who raced in the Lois Krall II boat, faced off against Hobart College and Massachusetts Institute of Technology, and ended up winning by 2.2 seconds ahead of Hobart with a final time of 5:36.60. The women’s second varsity eight team raced in the Cara Fry boat and faced off against MIT and the Georgetown University lightweight rowing team. Drexel came out superior in this race, as they beat the lightweight team by nearly seven seconds, with a final time of 6:35.20. The men’s second varsity eight team, who raced in a Sandra Lee Sheller II, went head to head against Hobart, and ended up victorious, edging them by one and a half seconds with a final time of 5:50.0. The women’s varsity four continued their hot streak with another win at this invitational. They raced in the Diane Corle boat and comfortably won with a time of 7:15.30. The Drexel men’s third varsity eight, racing in the Lois Krall boat, held off the University of Michigan for second place, but could not beat the United States Naval Academy, who finished 8.5 seconds ahead of them. The women’s varsity eight team, who raced in the new Alleva XVII boat, had a similar fate when their oars crashed with the Georgetown lightweight team’s oars, causing them to get second. The next day, the women’s varsity eight had more luck and edged out the University of Rhode Island by half a second to win with a time of 6:21.60. The women’s varsity four team got their second win of the invitational, defeating Rhode Island by nearly seven seconds. The men’s varsity eight team, as well as both the men’s and women’s second varsity eight teams, got second place finishes on the second day. The men’s varsity eight lost to Navy by 5.5 seconds, but the second varsity team got closer to them, only losing by 1.5 seconds. The women’s second varsity eight got the closest to getting first, finishing two-tenths of a second behind Rhode Island. 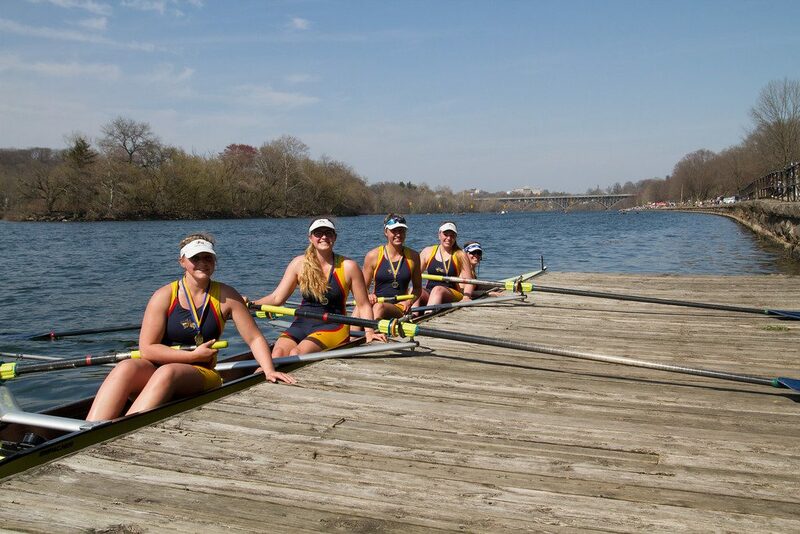 After these six wins, Drexel moved onto the annual Kerr Cup Regatta April 14, which takes place on the Schuylkill River. This event is hosted by Drexel and its alumni, and is in honor of Dr. Thomas Kerr, who was the founder and first coach of the crew team. In this regatta, the Dragons came home with four gold medals from the women’s varsity four, the men’s second varsity eight and both the men’s and women’s third varsity eight teams. The women’s varsity four team, racing again in the Diane Corle boat, easily coasted to a win with a time of 8:13.70. The men’s second varsity team raced a close match, especially in the last 500 meters, and ended up beating the University of San Diego by 1.9 seconds. The men’s and women’s third varsity eights won the first medals of the day, with the men’s team cruising to a win over Saint Joseph’s University by more than six seconds. The women’s third varsity match was a closer one, beating Saint Joe’s by only three-tenths of a second. The women’s varsity and second varsity eight, as well as both men’s freshman teams, all got second place finishes for the Dragons. The women’s varsity eight, who has won the Lela H. Kerr Cup for seven of the last nine years, had a strong time of 7:18.98, but Rhode Island ended up victorious, winning by nearly eight seconds. The women’s second varsity eight also could not overcome Rhode Island, losing by five seconds. The men’s freshman eight came close to beating Temple University, but ended up running out of water to catch up, losing by less than two seconds. The men’s freshman four had a similar fate, losing by just over two seconds to the University of Delaware. The Dragons will return to the Schuylkill to compete in the Bergen and Kelly Cups April 21. Both of these events are considered the unofficial city championships and are hosted by Saint Joe’s University.